Figure 1: Eclipse diagram for Greenwich Mean Time, February 21, 2008 (source). A total eclipse of the Moon occurs during the night of Wednesday, February 20/21, 2008. The entire event is visible from South America and most of North America as well as Western Europe, Africa, and Western Asia. From start to finish, the eclipse lasts about three hours and twenty-six minutes. The partial eclipse begins at the Moon's eastern edge, and slowly moves into the Earth's umbral shadow . The colour and brightness of the totally eclipsed Moon can vary considerably from one eclipse to another. Dark eclipses are caused by volcanic gas and dust which filters and blocks much of the Sun's light from reaching the Moon. But since no major volcanic eruptions have taken place recently, the Moon will probably take on a vivid red or orange colour during the total phase. After the total phase ends, it is once again followed by a partial eclipse as the Moon gradually leaves the umbral shadow. Ancient observations of solar eclipses from many different cultures and civilizations date back to at least 2500 BCE in the writings that have survived from ancient China and Babylon. Islamic astronomy became the western world's powerhouse of scientific research during the 9th and 10th centuries CE, and stood on the most advanced scientific tradition of its time. Significant contributions were made by scientists such as Al-Khwarizmi (Baghdad, ca 825 CE), the father of algebra, who developed also the first tables of trigonometric functions which remained the standard reference well into the modern era. Al-Khwarazmi's calculations were good to five places, allowing for unprecedented precision in astronomy and other sciences. To the North East of Iraq, in Syria, Muhammad ibn Jabir al-Harrani al-Battani (Albatenius) (b. before 858; d. 929 CE), a Sabian scholar whose work enjoyed a wide diffusion in Muslim lands, began with Ptolemy's works and recalculated the precession of the equinoxes, producing new, more precise astronomical tables. Al-Battani was undoubtedly one of the greatest Islamic medieval astronomers. He made notable contributions in different fields of astronomy. He made precise predictions of eclipses, and worked on the phenomenon of parallax. His greatest work in astronomy is al-Zij as-Sabi', which, due to the monumental work done by Carlo A. Nallino, is the best edited and commented Arabic astronomica table so far . This important text survived in only one Arabic manuscript copy preserved in the Escorial library in Spain. According to Nallino, it was written about 1100 CE. Al-Battani has recorded in his zij two solar and two lunar eclipse observations. These are probably the ones that helped Halley around the year 1693 to discover the tidal acceleration of the Moon. In Arabic astronomy, simultaneous celestial events – such as the eclipses of the Moon – were used to deduce the difference between local times in different locations and, hence, to build a system of geographical coordinates. A famous example of this simultaneous observation is given by the collaboration between Al-Biruni and Abu 'l-Wafa al-Buzjani. We know indeed that al-Biruni observed at his native town Kath, in Khwarezm, the eclipse of the moon on 24 May 997 CE. The eclipse was an event that was also visible in Baghdad and al-Biruni had arranged with Abu 'l-Wafa to observe it there. Comparing their timings enabled them to calculate the difference in longitude between the two cities . 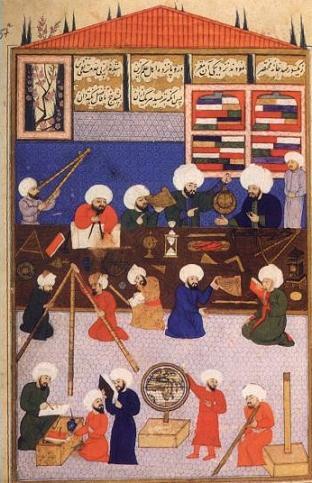 Figure 2: An image of an Islamic observatory, showing an astrolabe in use (source). In the 10th century, Ibn Yunus (who died in 1008 CE) observed more than 10,000 entries for the sun's position for many years using a large astrolabe with a diameter of nearly 1.4 metres. His observations on eclipses were still used centuries later in Simon Newcomb's investigations on the motion of the moon, while his other observations inspired Laplace's Obliquity of the Ecliptic and Inequalities of Jupiter and Saturn's. 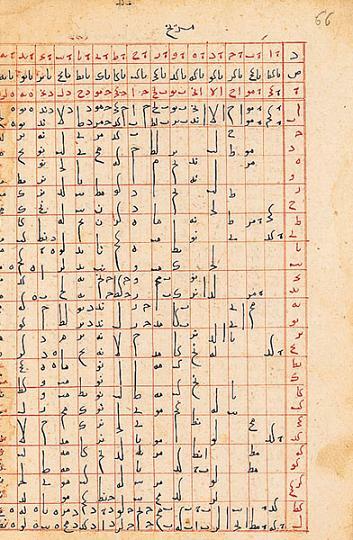 Working in Cairo and following a steady series of advances in Islamic trigonometry, Ibn Yunus preserved in his al-Zij al-Kabir al-Hakimi precious records of lunar and solar eclipses. Albeit its special status in the history of astronomy, this important text has not yet been edited in a critical edition and a serious commentary. It exists in a fragmentary copy in Leiden University Library (MS 1957, Cod. Or. 143). The observations preserved in it, among them the most important compilation of solar and lunar eclipses of the epoch, were used successfully more than two centuries ago to determine the secular tidal acceleration of the Moon. Caussin de Perçeval published in 1804 the Arabic text of these first chapters together with a French translation . The printed Arabic text represents the-only serious preliminary study, but his French translation is not precise enough and sometimes misleading. Although this publication is by no means a critical edition, it was taken by several modem astronomical and geophysical studies in the 19th and 20th centuries. Arabic historical sources are rich with eclipse records of the Sun and Moon that are given in Hijri dates. Besides the accounts that we mentioned in an earlier article , we selected hereafter some of them on the basis of the available literature. It is noteworthy to point out the variety of the sources in which astronomical events are narrated in Muslim heritage, from scientific text books to popular chronicles and general histories. This interest in natural phenomena, especially when they occur on a large scale in the heavens is a good indication of the wide spread of scientific culture in the culture of Islamic lands. Nowadays, this provides a good means to date precisely the events of general history linked to these astronomical events . IJ = Ibn al-Jawzi, al-Muntazam . NM = Not mentioned in the four previous Arabic sources. Beyond the traditional work of collecting historical data, a group of scientists examined recently the records of eclipses extracted from Arabic texts of astronomy and drew from them exciting results that shed new light on the secular changes in the Earth's rotation. This trend of work was led by F. Richard Stephenson from Durham University . In order to decipher Arabic texts, Stephenson collaborated with S. S. Said, from the College of Science, King Saud University in Riyadh. A recent significant contribution to this research was made by a German scholar, W. Dalmau from the University of Tubingen (Institute of Astronomy and Astrophysics), who collaborated with a professional historian of Islamic science, Mathias Schram. Figure 3: Astronomical table for the Sun, the Moon and the planets by Ibn al-Shatir, preserved in Paris, Bibliothèque Nationale, MS Arabe 2522, folio 66vo (Source). We summarize below the main results of these fascinating researches which personify how the history of science may be a testbed for contemporary science, and in the same time provide a concrete basis to the general slogan of "bringing life to Muslim heritage", by showing that this slogan is adapted not only for the general learned public but also for the scientific community as well. As expressed by W. Dalmau, the thesis for this new research program is as follows. The use of some Arabic medieval lunar eclipse records  for the determination of secular changes in the Earth's rotation opens a critical area of research in which several scientists are engaged. The published results derived from these data suggest a non-uniform decrease in the Earth's rotation rate over the last millennium. There is, however, up to this day no sound physical explanation for the deduced "non-tidal oscillations", with an apparent period of about 1500 years, which overlaid to a constant secular tidal change in the Earth's rotation rate and produce a non-uniform deceleration of the Earth's rotation. Relying on the appropriate analysis of a set of observations which were executed by professional Arabic astronomers, the scientists show the way in which the non-uniform deceleration of the Earth's rotation was constructed. A correct reading of the Arabic medieval observations shows that they do not contradict a secular constant decrease in the Earth's rotation rate of nearly -4.6×10-22 rad s-2. This value is in accordance with other similar ones derived from ancient eclipse records and from satellite tracking data . Relying on the numerous solar and lunar eclipse timings measured by Arab astronomers between about 830 and 1020 CE, Stephenson and his colleagues scrutinized in particular eclipse records exposed by Ibn Yunus in al-Zij al-Kabir al-Hakimi. "This lunar eclipse was in the month of Rabi ‘al-Akhir in the year 369 [H], on the night when the morning was Friday the 13th of the month… A group of scholars gathered to observe this eclipse… The altitude of the Moon when they perceived the eclipse was 64 1/2 deg in the east. The altitude when its clearance completed was 65 deg in the west." Analysing these data, Stephenson concluded that it may be calculated that at Cairo the Moon would reach an altitude of 64.5° in the east at a UT of 20.08 h; this was the observed time of first contact. Similarly, fourth contact was observed at a UT of 23.30 h. Comparing these times with the computed values, he inferred that these two results are in adequate accord . The data from solar and lunar eclipse observations obtained by Islamic astronomers during the period 829-1019 CE were compiled in tables and analyzed to estimate non-tidal variations in the earth rotation rate. Describing the data set and computational procedures, the results were presented in graphs. It turns out that the average length of the day in 950 CE is found to be 11.6 + or - 0.6 msec shorter than the present standard value (86,400 sec), consistent with an increase of 1.37 + or - 0.07 msec/century over the intervening period. The latter value is less than that predicted for tidal friction alone or that estimated on the basis of ancient Babylonian records . On the basis of the above, significant long-term non-tidal variations are inferred . Figure 4: Astronomical calculations in the Arabic translation of Ptolemy's Almagest, translated by Ishâq b. Hunayn (830-910), revised by Thâbit b. Qurra (836-901). Copied in the Maghrib or al-Andalus in 1221. Paris, Bibliothèque Nationale, MS Arabe 2482 folio. 36v-37r (Source). Historical observations of eclipses have been the best tools for determining secular changes in the Earth's rotation rate, until today. Relying on the analysis of eclipse records produced by Arab astronomers, mainly al-Battani, al-Biruni and Ibn Yunus, F. R. Stephenson, L. V. Morrison, S. S. Said, R. R. Newton and W. Dulmau set to study the Earth's rotation rate. These scientists do not agree in their interpretation of the conclusions they infer from the analysis of the data. The line of demarcation between them is the following: while the British group led by Stephenson concludes that the Arabic records of eclipses provides the ground for a decrease in the rotation rate of the Earth, Dalmau rejects this conclusion and states: "In our opinion, the authors listed above have not evaluated the Arabic records with the sufficient care. They have taken the numerical data from the sources without considering the context. The statistical method used by them meets by no means the requirements of the subject. The theoretical models and astronomical tables used by the Arabic astronomers are essential for their work and their observations, but they have been completely neglected. For the present, it can be stated that the Arabic medieval observations do not contradict a constant secular change in the rate of the Earth's rotation, its numerical value being nearly -4.6×10-22 rad s-2 ". Dalmau concludes his article by calling to historians of science to provide the documentary basis to decide in this debate. He considers indeed that the exact determination of the secular change in the Earth's rotation will depend on a critical edition with a serious commentary of the zij of Ibn Yunus, because it yields the best source of information on the relevant observations. Brunier, Serge, and Jean P. Luminet, Glorious eclipses: their past, present, and future. Translated by Storm Dunlop. Paris: Bordas; Cambridge: Cambridge University Press, 2000. Caussin de Perceval, Armand-Pierre, "Kitab az-Zij al-kabir al-hakimi rasad as-saih Abi l-Hassan 'Ali ibn Ãbdarrahman ibn Ahmad ibn Yunis. Le livre de la grande table Hakémite, observée par le Sheikh Abdoulhassan Ali ibn Abderrahman, ebn Ahmad, ebn Iounis", Notices et Extraits des manuscrits de la Bibliothèque nationale et autres bibliothèques (Paris) 7. 12 (1803/1804), pp. 16-240. [Reprinted in Ibn Yunis (d.399): Texts and Studies 1. Collected and reprinted by Fuat Sezgin et al., Frankfurt: Institut für Geschichte der Arabish-Islamischen Wissenschaften, 1997, pp. 54-278]. Dalmau, W., "Bestimmung des sakularen Verhaltens der Erdrotation", Veroffenthchungen des Institutes fiir Geschichte der Arabisch-lslamischen Wissenschaften, Reihe A: Texte und Studien, Bd. 6, 1993. Dalmau, W., "Critical Remarks on the Use of Medieval Eclipse Records for the Determination of Long-Term Changes in the Earth's Rotation", Surveys in Geophysics, vol. 18, N° 2-3 (1997), pp. 213-223. King, David A., The Renaissance of Astronomy in Baghdad in the 9th and the 10th centuries: A List of Publications. Nallino, Carlo A. , Al-Battani: Opus Astronomicum. Ad fidem codicis escurialensis arabice editum Latine versum, Pubblicazioni del reale Osservatorio di Brera in Milano, 3 vols. , 1899-1907 (vol. 1: 1903, vol. 2: 1907, vol. 3: 1899). Nallino, C.A., "Raccolta di scritti. Editi e inediti", Pubblicazioni dell' Islituto Per l'Oriente (Roma), vol. 5, 1944. Stephenson, F. Richard, Historical Eclipses and Earth's Rotation, Cambridge University Press, 1997. Stephenson, F. R.," Historical Eclipses and Earth's Rotation, Astronomy & Geophysics, vol. 44, N° 2, April 2003 , pp. 2.22-2.27. Stephenson, F. R. & Said, S. S., Non-tidal changes in the earth's rate of rotation as deduced from medieval eclipse observations, Astronomy and Astrophysics, vol. 215, no. 1, May 1989, pp. 181-189. For more information on how, what, why, where and when of lunar eclipses, see the special web page lunar eclipses for beginners and click here for times and phases of the total Lunar eclipse of February 20/21, 2008. For more details on eclipses in Islamic astronomy, see Precious Records of Eclipses in Muslim Astronomy and History. For a general view of this zij and many others see E. S. Kennedy, "A Survey of Islamic Astronomical Tables", Transactions of the American Philosophical Society, N.S., vol. 46, Part 2, 1956, pp. 123-177; and C. A. Nallino, C.A., "Raccolta di scritti. Editi e inediti", Pubblicazioni dell' Islituto Per l'Oriente (Roma), vol. 5, 1944. Mentioned in: M. Abattouy, "Al-Bîrûnî", In: Lexikon bedeutender naturwissenschaftler, Heidelberg-Berlin: Spektrum Academischer Verlag, 2003, vol.1, pp. 178-183. See for more details: E. S. Kennedy, "Al-Biruni" Dictionary of Scientific Biography (vol. 2, New York 1970-80); Id., Studies in the Islamic Exact Sciences (1983 Beirut); G. Saliba, "Al-Biruni and the sciences of his time," Religion, Learning and Science in the 'Abbasid Period, M. Young et al. (Cambridge 1991, pp. 405-23). A. P. Caussin de Perceval, "Kitab az-Zij al-kabir al-hakimi… /Le livre de la grande table Hakémite…", Notices et Extraits des manuscrits de la Bibliothèque nationale et autres bibliothèques (Paris) 7. 12 (1803/1804), pp. 16-240. See Precious Records of Eclipses in Muslim Astronomy and History. The records quoted in the following table are extracted from: Incidents of Sun and Moon Eclipses in Medieval Times: From the Ibn al-Athir, Ibn al-Kathir and The Anglo Saxon Chronicles. Ibn Kathir (701-774 ) the famous historiographer and compiler of Al-Bidaya wa 'l-nihaya fi al-tarikh (the beginning and the end in history). The book is a universal a history of Muslims from Adam until Ibn Kathir's time, it is considered to be one of the most authoritative sources on Islamic history. Edited in Cairo, 1932-29, 14 vols. Abu al-Hassan Ali ibn Muhammad ibn Muhammad, better known as Ali 'Izz al-Din Ibn al- Athir al-Jazari (1160 – 1233), author of Al-Kamil fi al-Tarikh (the complete book of chronicles). Edited by C.J. Tornberg, 13 vols. (Leyden, 1867-74).Click here for the online text. Muhammed b. Ahmad b. 'Uthman ibn Qaymaz al-Zahabi was born in Damascus in 1274 and died in 1347. He is the author of Tarikh al-islam wa-wafayat al-mashahir wa-'l-a'lam. See the recent publication in Beirut, Dar al-kitab al arabi, 1987, 52 vols. Abu-Al-Faraj Ibn Al-Jawzi (508-597H) wrote many large books, especially a very important historical source, mainly for the author's own lifetime, but it also has bits of information about earlier times that are otherwise lost: Al Muntazam Fi Tarikh Al Muluk (Dar al-kutub al-'llmiya, Beirut, 1995, 18 vols., 6934 pp. Professor F. Richard Stephenson (born 1941) is an Emeritus Professor at the Physics department and East Asian Studies department at the University of Durham. His research concentrates on historical aspects of astronomy. These records amount to sixty observations derived from Arabic sources, whether from the works of professional astronomers such as al-Battani, al-Biruni and Ibn Yunus, or from general works of history, such as those mentioned above. W. Dalmau, "Critical Remarks on the Use of Medieval Eclipse Records for the Determination of Long-Term Changes in the Earth's Rotation", Surveys in Geophysics, vol. 18, N° 2-3 (1997), pp. 213-223. F. R. Stephenson, "Historical eclipses and Earth's rotation", Astronomy & Geophysics, vol. 44, N° 2, April 2003 , pp. 2.26. As shown in F. R. Stephenson and L. V. Morrison, "Long-term changes in the rotation of the Earth: 700 B.C. to A.D. 1980", Philosophical Transactions of the Royal Society of London, Series A, Series A 313, 1984, pp. 47-70. See for more details F. R. Stephenson, Historical Eclipses and Earth's Rotation, Cambridge University Press, 1997, chapter 13 "Observations of eclipses by medieval Arab astronomers", pp. 456-486. W. Dalmau, "Critical Remarks on the Use of Medieval Eclipse Records for the Determination of Long-Term Changes in the Earth's Rotation", op. cit., p. 222-223.